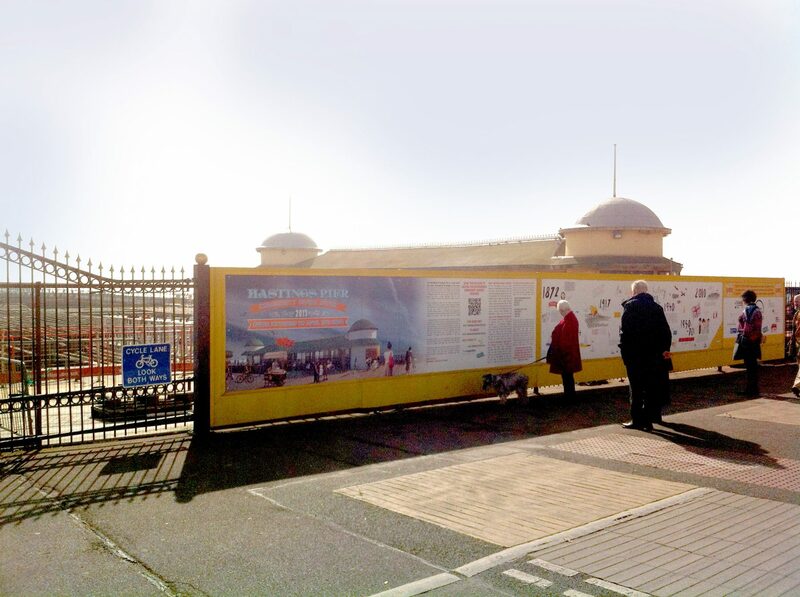 We were commissioned by Hastings Pier Charity (HPC) to manage and design information and artworks to be displayed on the hoardings which will cover the Pier railings for the duration of the rebuild starting October 2013 and giving passing pedestrians additional information on the progress and adding an element of story telling about the Piers journey so far. 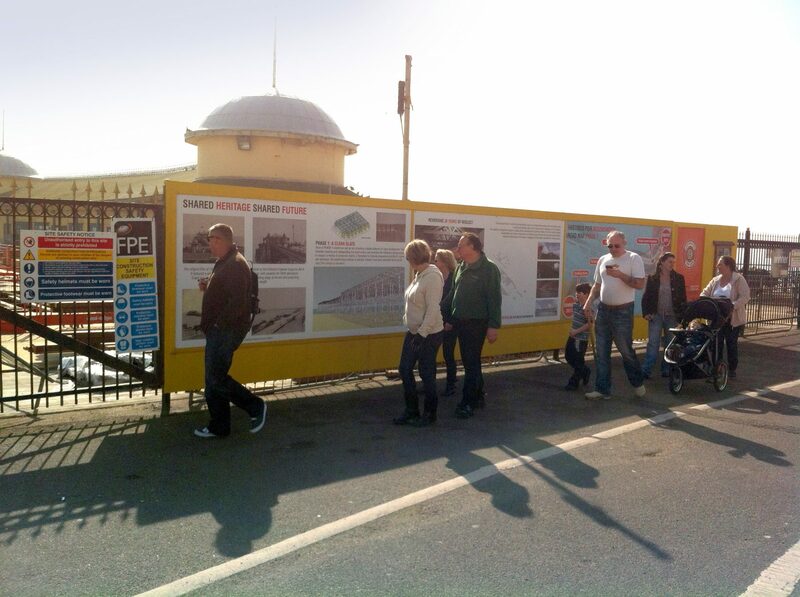 The hoardings are a mixture of different types of information ranging from technical explanations of the complex task of rebuilding the substructure to a more playful approach using highlighting significant stories from the piers history illustrated by Nina Cosford. 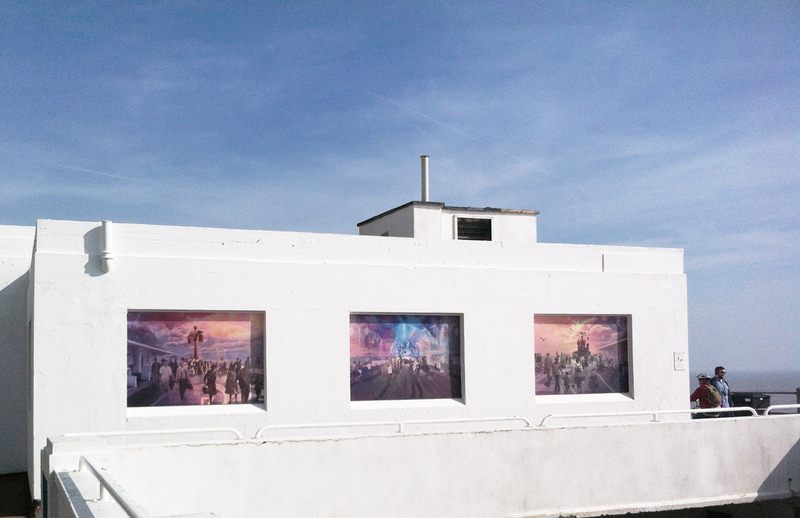 The charity also commissioned a mural from us that would engage the public with the piers history and encourage participation as they build a digital archive that will eventually form the basis of an exciting and interactive permanent exhibition in the new visitors centre. 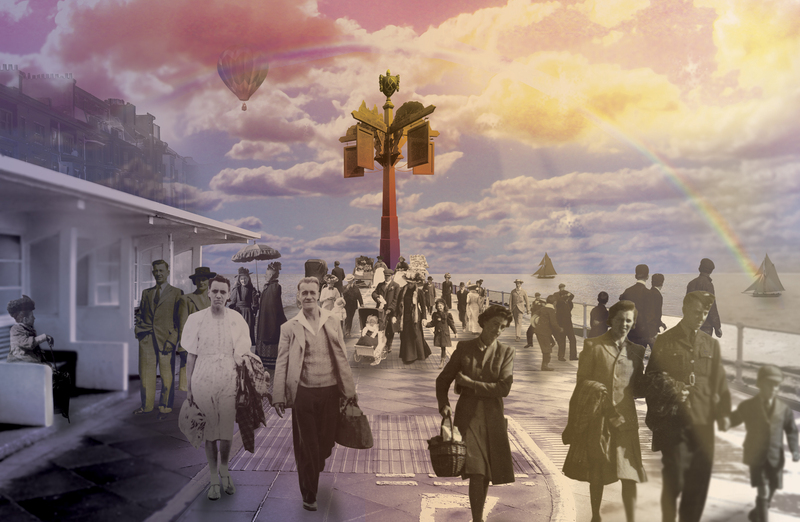 We chose the subject of ‘promenading’ as a theme for the work and a starting point for the content of the photographs. 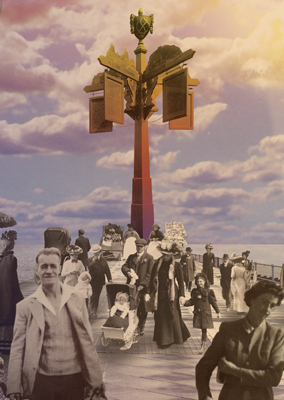 Hastings and St Leonards has a rich heritage in this pastime plus we wanted to further explore this cultural behaviour as it represents an extension of an idea from a previous art project commissioned by Coastal Currents arts festival. We used social media as a platform to engage the public and resources from the library and museum. 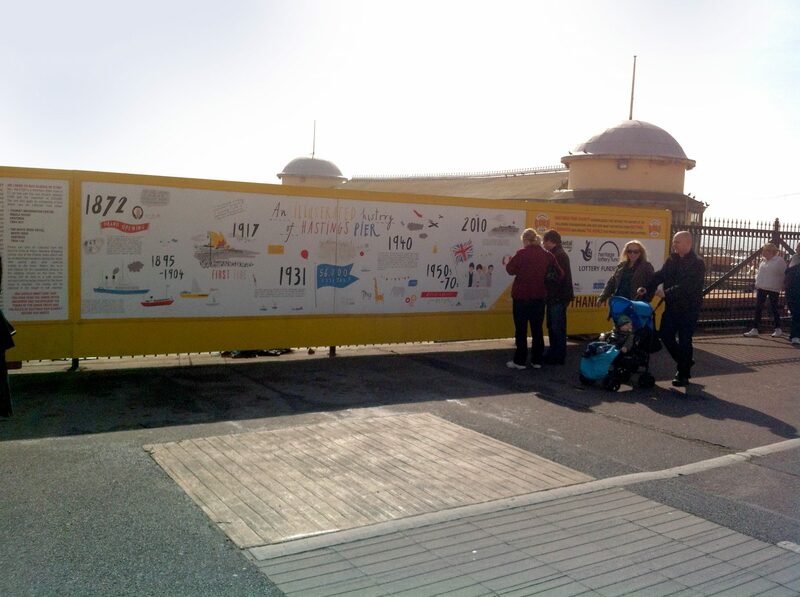 The tryptich depicts a vision of the past and future pier and promenade made from historical photographic montages taken from 1880 to present day featured in the side panels. 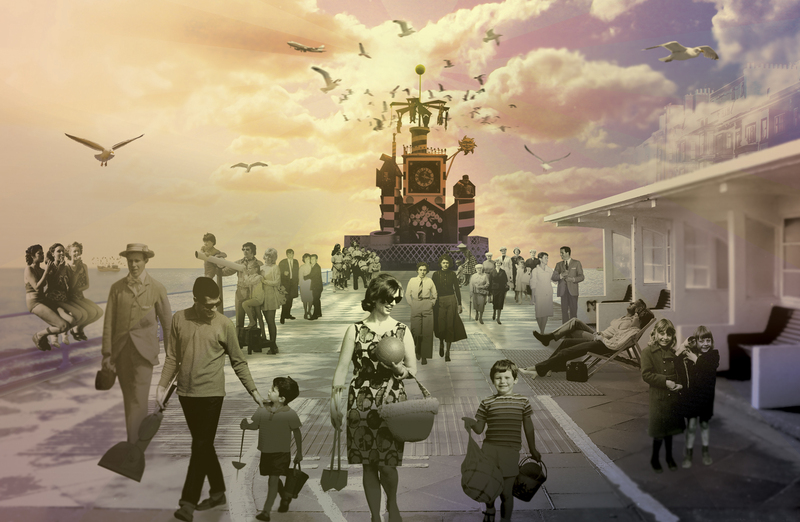 We included structures like the infamous Guinness clock which used to sporadically appear on the promenade during the 1950’s and would delight passers by with its absurd automaton characters of animals and their keepers who would burst into life every 15 minutes to the sound of fairground music. 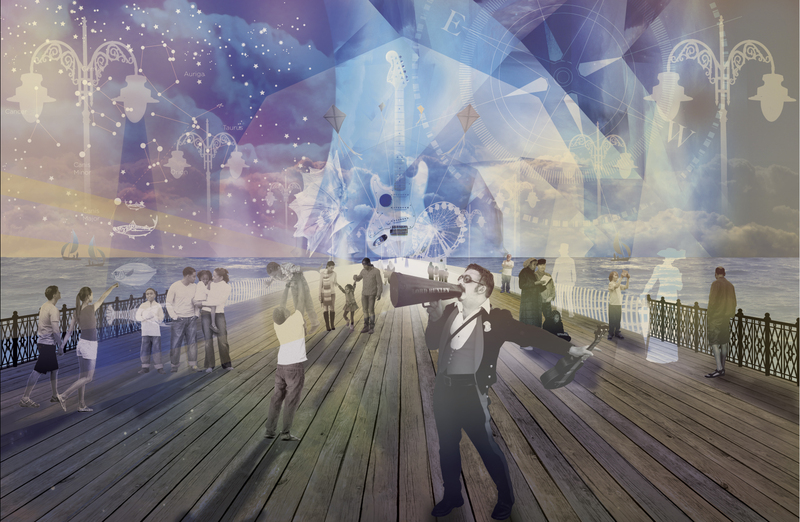 The future (central panel) has a pier like platform which stretches into infinity with references to the culture, geology and astronomy of the space. 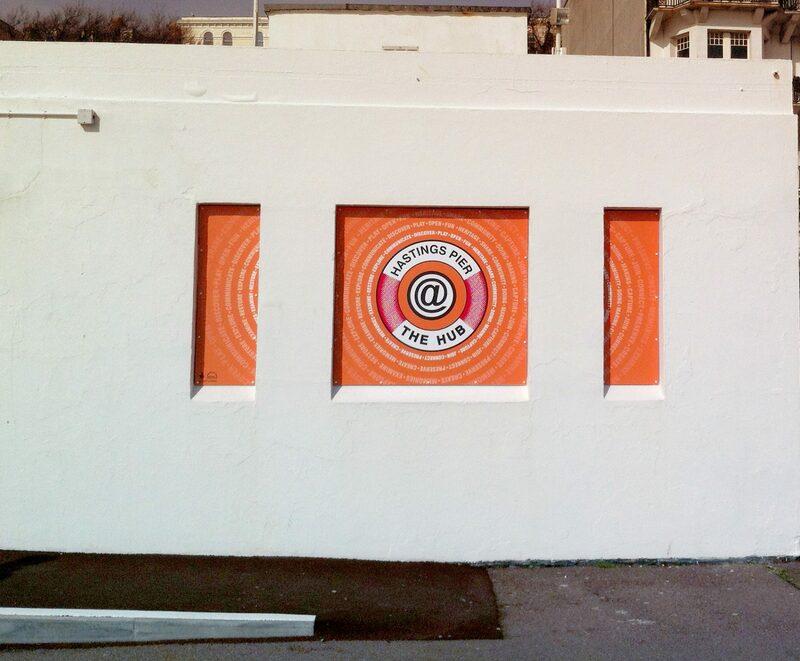 With special thanks to Alexander Brattell, Rebecca Child, Rebecca Snotflower, Gill Sutton, Hastings Library and Hastings Museum and Paul at South Coast Digital Printing.